UAE-based Petrogear Oilfield Equipment Manufacturing, a one-stop shop for CNC (computer numerical control) machining, fabrication and design, is pushing forward with an aggressive $8 million capital expenditure programme which includes developing a new purpose-built 11,000 sq m facility in Ras Al Khaimah. This purpose-built facility will feature a fully enclosed climate controlled 1,800 sq m CNC machine shop, a 2,400 sq m open wall warehouse for medium fabrication, and an 80 m by 24 m heavy fabrication area complete with a 40 tonne 18 m high gantry crane capable of travelling 70 m, says Brandon M Davis, general manager, Petrogear Oilfield Equipment Manufacturing LLC. Furthermore, Petrogear’s new facility will feature a 16 m (L) by 6 m (W) by 6 m (H) sand blasting room and a 16 m (L) by 6 m (W) by 6 m (H) spray paint booth, among the largest in the region. "Additionally, some of the region’s largest state-of-the-art CNC machinery and equipment will be set up in the new facility to increase our capacity and scope of services," says Davis, who is also general manager of Petrogear FZE. With the addition of the new purpose-built facility opening in 2019, Petrogear will relaunch as a group of companies, as Petrogear Oilfield Equipment Manufacturing LLC and Petrogear FZE offering clients the benefits of working with both LLC and FZE registered companies, he says. For other LLC companies, it can often be a lengthily process to prepare and ship equipment into a freezone, and vice versa, shipping from a freezone to LLC registered companies. "Being able to offer our clients both options based on their positions vastly enhances their ease of doing business with us. Both our facility locations are minutes apart and will provide all the same services and activities in both locations," he says. 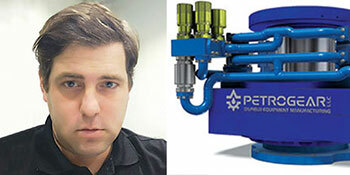 Petrogear believes it has strategically positioned itself to become a leading manufacturer and supplier, both domestically and internationally, of hydraulic workover and snubbing equipment based specifically on its ability to design and improve on equipment with its new product launches, while maintaining a streamlined operation. "Our soon to launch full range of slip bowls, rotary tables, and HWO support equipment will raise the level of quality and thought-out design upgrades. We feel wholeheartedly that clients will take notice of these new concepts and our equipment will set the bar for new specifications to be adhered to when service companies are writing their tender requirements," he says. 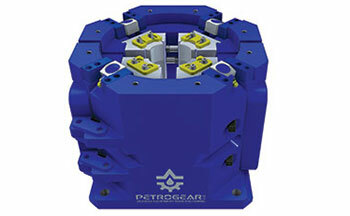 Petrogear recently designed and manufactured the world’s first high performance rotary table for the hydraulic workover and snubbing sector, being the most versatile and highest performing rotary table available for hydraulic workover units. Rotary table performance is driven by two key factors, the design of the rotary table and the hydraulic power unit driving it, he explains. Petrogear designed its rotary table to operate over the well with specifications that exceed all others in the international marketplace. Then the design was enhanced by making the rotary table tunable, with different gear sets and motor displacements that can easily be changed in the shop or in the field. This means that the rotary table can be set up to match a hydraulic power units pump displacement, pump pressure and horsepower or can be tuned in the field for a specific project or for unexpected well conditions, he continues. "We manufactured this rotary table jointly for Petronas and Uzma BHD with a total R&D investment of $1.1 million, to be operational in December 2018. We also manufactured the region’s first 28,000 ft lbs/150 RPM dyno torque test unit for rotary tables, swivels and power tongs," says Davis. Some of the main challenges with this equipment were that these torque figures and revolutions per minute have never been achieved on any other manufacturer’s rotary table prior to this unit. Petrogear faced challenges in sourcing components that met with its design criteria, and faced challenges with sourcing suppliers with relatively moderate lead times. It was also crucial to select components that would be readily available on the shelf for spare parts. "Often designers do not think about the lead times certain manufacturers have when selecting components, and for us, it was critical to select readily available components for our rotary tables," he observes. Petrogear is currently manufacturing Zone 2 Hydraulic Powerpacks certified for ATEX group 2 category 3G; designed for Gas Group IIA and temperature class T3 (200°C limit and Fully certified to EN1834-1:2000, DNV GL 2.7-2. Standards. Being a new player in the Middle East, Petrogear aims high to design and build industry leading equipment with the highest standards and entering the manufacturing of Zone 2 hydraulic powerpacks was a decision made with the utmost of confidence. "We currently will have over $2.45 million invested into the research, development and manufacturing of these units, which will become available for sale or on rental basis in Q2, 2019," he reveals. Talking about business growth, Davis says the company’s business has seen a steady incline in new equipment sales based on its off-plan designs. In the previous year the scope of work was progressive on refurbishment of equipment, however companies are seen procuring new manufactured equipment. "Although we still conduct frequent large refurbishment work on all types of equipment, we are pleased with the increased notoriety in our design and manufacturing capabilities," he says. Petrogear took a proactive approach to falling oil prices, he says. It gave the company ample time in R&D to set itself years ahead of its immediate competition by redesigning and developing oilfield equipment that has frankly not had any major improvements or significant upgrades in the industry for a decade. "Two years on, we are in the final stages of doing a massive launch of this equipment range catering to the hydraulic workover and snubbing sectors among others. While we feel other companies were laying off personnel and minimising their operational costs, Petrogear expanded its team, its facilities, its machinery and equipment range, and most importantly we invested in the training of our valued team members," says Davis. As the general manager and a founding member of Petrogear, Davis says: "We started this company in October 2016 when nobody would conceive investing in the oilfield industry. When companies were selling off assets, dismissing personnel and reducing expenditures, we started with a blank sheet of paper and invested heavily on equipment, machinery, a purpose-built facility, our team, along with research and development and manufacturing of new equipment product lines. "It is a testament to our quality, ingenuity, forward thinking and most of all our passion to design and build the best thought-thru equipment in the market, that we have grown to where we are today and will continue to offer superior equipment and lead by example for years to come." Petrogear currently has a fabrication and welding team of 35 experienced personnel, 12 CNC machine operators, and a dedicated hard-working office team of seven. On the company’s proactive attitude towards opportunities, he says Petrogear noticed a niche gap in the Middle Eastern service sector for pull testing equipment that typically exceeds pull test loads that surpass crane capacities in the region. The company designed and manufactured a 1,000 metric tonne hydraulic pull test machine, with the modular flexibility to pull test equipment with a recordable 1,000 metric tonnes of pull force and 500 metric tonnes of push force. The 1,000 tonne modular hydraulic pull test unit can test various equipment such as slip bowls/snubbing slips, elevator bails up to 15 ft, elevator links, H-links, elevator spiders, pull nubbins, shackles and rigging equipment, mooring equipment, spreader bars and lifting eyes and bop collars. "Gone are the days where large mobiles cranes, heavy anchors blocks and massive rigging equipment are needed to pull test equipment," he says. Petrogear’s ability to serve as a one-stop shop for CNC machining, fabrication and design is achieved through the array of services that it can provide. "Our vision is to be your preferred partner for your manufacturing needs in the oil and gas industry," he says. Being independent makes all the difference and Petrogear combines the comprehensive value-added services of large companies with the responsive service and competitive costs of a smaller independent company, says Davis. The company’s services include a state-of-the-art high precision CNC machine shop; a wide range of certified welding services including robotic welding; CNC waterjet, plasma, punching and laser profile cutting; fabrication; abrasive blasting and a wide range of corrosion protection applications; bespoke design and engineering; a 1,000 tonne hydraulic pull testing unit; 28,000 ft lbs/and up to 150 RPM dyno torque testing for rotary tables, swivels and power tongs.